What is The Best Way to Purify Water? How to Purify Water Safely. Having access to clean and toxin free drinking water is a necessity to human health and avoiding disease and illness. So What is the Best Way to Purify Water? There are quite a few good water purification methods, depending on whether you are filtering tap water or water from a questionable outdoor source, like a river, stream, lake or pond. You can filter water safely from all sources with a water filter that fits the type of water you need to purify. Recently in Flint, Michigan people have been getting poisoned by their tap water. Chemicals and heavy metals like lead are causing serious health issues and fatalities. Please do not drink the tap water, or give it to your kids or even pets. Use a heavy metal water filter like the pure effect filters that gets rid of heavy metals, radiation, pathogens and makes the water a healthy alkaline too. Our bodies are made of mostly water (70-80%) as are our brains. We need fresh, clean drinking water for our bodies and brains to work at their best. Brita and Pur have some simple tabletop units, although they improve the taste somewhat (I still can’t stomach Brita), they don’t get rid of the heavy metals, radiation, fluoride, chlorine, pharmaceuticals (hormone disrupting birth control pills), and small sized harmful bacteria. The one portable water filter that can are Berkey Water Filters. I have the Big Berkey Water Filter myself, and absolutely love it! The complete Berkey Filter line is beautiful made of polished stainless steel (with the exception of the Berkey Light Water Filter) and all except the travel can use the fluoride removing water filter cartridges. It is also highly durable and will last as long as your car, maybe longer! It has the purification power to filter dirty water into safe, clean, pure and great tasting drinking water, unline any other portable water filter period! 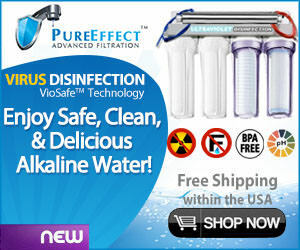 You can see their whole line and get individual reviews at: Berkey Water Filter Review. You can also purify water outdoors by using a manual pump system or Hiking Water Filter. This is great for hiking water filter for the outdoorsman or woman. I take mine on camping and day hikes, as you can for sure get sick when you’re unsure what’s upstream from you, entering the water you are drinking. I use the Berkey for camping, but always take a Katadyn when I go for long hikes. Clean Drinking Water is the thing you need most when in the great outdoors. Best to be safe and sure than really sick and stuck in the wild. This is also another great emergency backup, in case there is some extended sunspot activity that takes out our electrical grid. No need to panic, just be prepared beforehand. The Katadyn pocket water filter is a great choice for a manual water filter that will filter out toxins and pathogens from questionable water sources. Home Water Purification Systems usually deal with treated water or tap water. Some can also use well water sources. You need a home water filter because most tap water has things like flushed medicines, fluoride, heavy metals, microbes, chlorine and sodium fluoride that harm your brain, nervous system, DNA and whack your immune system. Also get a filter that requires no electricity so you can still have clean water if the grid or your power goes out for an extended amount of time. It happens. The pure effect home filter systems, like the Berkey do just that. In an emergency where the you have natural gas you can heat water till it’s boiling, and that is a viable emergency solution. It’s recommended to have an easy to use solution that doesn’t require a lot of external energy, not only for emergencies, but for your every day health. Use it to fill up you water bottles (BPA free water bottles) and take them with you! The following natural treatments will make your water drinkable and remove deadly radiation, heavy metals (including chlorine and fluoride), pathogens, bacteria, viruses, giardia (from human and animal feces) and other harmful toxins from your water. These are good ways to purify water anywhere. They are all great as long as you have at least one! I have 3 personally, The Katadyn (for hiking), The Big Berkey (for parties, get together’s, guests, picnics), and The Pure Effect for my home.